At the end we would like to add that the political military leadership of Azerbaijan bears full responsibility for the consequences of the incident, the Artsakh Republic Ministry of Defense Press Service informed. 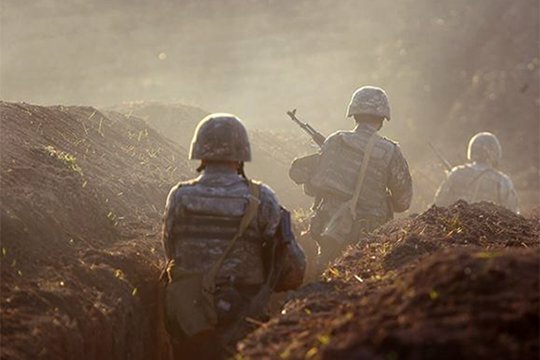 On July 4 the enemy continued to breach the ceasefire at the line of contact between the Artsakh-Azerbaijani forces firing mortars of different calibers and at 8:20 pm it used TR-107 multiple rocket launchers in the southern direction, the press office of the Artsakh Ministry of Defense informed. Azerbaijan used TR-107 for the first time since the escalation in April 2016. “At 11:30-11:35 the Azerbaijani side fired 82 mm mortars (4 projectiles), at 12:45-12:55 anti-tank grenade mounted launchers (3 projectiles) in the eastern direction. In the southern direction, at 13:35 Azerbaijani forces fired 60 mm mortars (3 projectiles), at 19:10 60 mm mortars (2 projectiles), and between 20:20-20:30the Azerbaijani forces opened fire from the military base located in Alkhanlu village from TR-107 multiple rocket launchers (5 projectiles) in the direction of the command point of one of the military units, at 20:48 firing also 82 mm mortars (3 projectiles). To restrain the enemy’s aggressive activity, the front units of the Defense Army had to undertake counteractions between 20:31 and 20:40 and damaged the fire emplacement in Alkhanlu village. According to the reliable information provided by the relevant services of the Defense Army, the enemy has casualties. The Defense Army has no casualties in the result of the Azerbaijani provocations.